I love the small batch concept, which nearly everyone is doing some version of these days. Naturally, there will be hits and misses (the Oliva Master Blends haven’t done much for me, for example), but it’s nice to have something new to try every time I toddle into a walk-in. The first thing I notice after lighting is the booming draw. I expect a 54 ring gauge to throw some smoke, certainly, but this one’s extraordinary. Based on looks alone, I expected this stick to open with a slap in the head and some sinus tingle. What I got instead was sophisticated, bright and pleasant. The flavors are big, but not at all jolting. It has a sweet cedar core, nuts, and red spice but without much heat. This spice component was interesting enough to send me into the kitchen to poke around the spice drawer. The best description I can conjure is smoked paprika, cayenne and white pepper in almost equal proportion. But again, it’s much more about the flavor than the heat. A third of the way in, the finish lengthens and picks up a touch of caramel. It’s medium-bodied, but getting heavier approaching halfway. It remains impressively complex, even as the spice gives way to a darker, chewier profile. Wood and rich nuts begin to take over, with the addition of some damp leather. But every time I think it’s settling into a more typical groove, this stick throws me a curve somewhere on the finish. First I pick up a dash of cinnamon that remind me of La Flor’s Coronado. Then there is chocolate reminiscent of an Oliva V.
On the closing third, it takes one final turn toward dense earth and leather. The draw heats up with an inch and a half remaining, though I’m thoroughly satisfied that I’ve had my money’s worth. CONCLUSION: As regular readers know, I’m usually so annoyed by the idea of a $16 smoke that I turn savagely picky, looking for reasons to mock the MSRP. 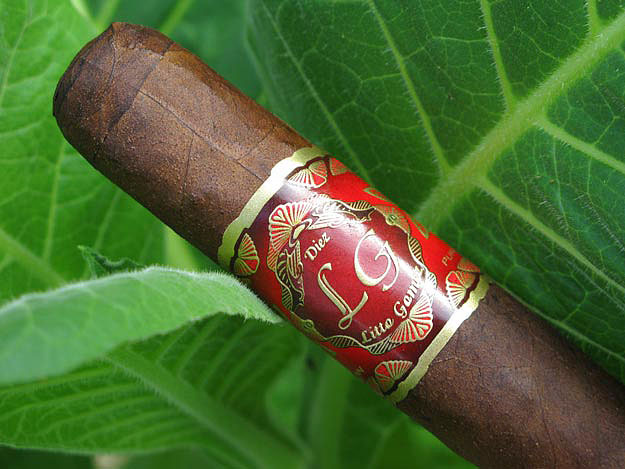 But I am completely disarmed by the Litto Gomez Small Batch No. 2. It’s one of the best smokes I’ve had this year. It stands out in all respects — refined strength and complexity, great construction and constant surprises. It was a unique experience, downright fun to smoke. It’s a ride I can’t afford to take twice, but just this one time I feel rewarded for having been an easy mark at the B&M. You crack me with your opening two paragraphs! I can so relate to that. Sometimes a cigar just puts out it’s siren song and next thing you know you’re signing the credit card slip for a $20 cigar… whoops, that was me buying the Ashton ESG, hehe. I guess my preaching to my daughter that we have to tighten up our spending doesn’t apply to mommy. Ha, I’m not alone! I shouldn’t be allowed into those places without adult supervision.